In the UK, for example, the number employed in manufacturing fell from 27% to less than 8% today. And it was not just in the “industrialising world” that low wages prevailed. Workers today in the older capitalist states have real incomes lower than in 1979 despite a massive rise in productivity (i.e. exploitation) in manufacturing. Even the bosses’ papers admit it. In the face of job losses (especially in heavy industry), globalisation and capitalist restructuring over the last four decades there are plenty who think that the working class in the older capitalist states has lost “its identity”. Changed its identity we would say. And this is nothing new, as the shape of the working class has constantly changed throughout capitalist history. Today in the UK 83% of the workforce is in the services sector, which includes such socially necessary areas as health and education. As the system slides into deeper and deeper economic crisis these sectors cannot be funded adequately. The result is that once-privileged ‘professionals’ with years of education and training behind them are in the frontline of capitalist attack. Their working conditions are becoming increasingly like those of every other worker. From doctors to lawyers, script writers to teachers, a whole range of professionals are finding they have no more control of their job decisions than people controlled by “apps” in warehouses or the gig economy (another sector of the class where resistance is on the rise). We got a taste of how the professions have been proletarianised in the UK junior doctors’ strikes two years ago and in the Durham and Derby teaching assistants’ fight last year. Now it is the turn of education workers across the world. As we go to press Kentucky and Oklahoma teachers have just gone on strike In Kentucky it over pension cuts. In Oklahoma it’s about a 28% cut in the education budget (since taxes have been cut) which has made some schools go to a 4 day week. Arizona teachers are likely to follow them soon. No doubt they are all encouraged by the long struggle animated by West Virginia teachers who took on the state with virtually no support from their union. In Kenya and Zimbabwe strikes of lecturers have been going on for weeks. In Kenya these have been accompanied by strikes of nurses, some of whom face long arrears of pay. That these are now part of the proletariat would have come as no surprise to the young Karl Marx. He predicted that capitalist development would polarise society and destroy the middle class, reducing the vast majority to the condition of proletarians. In the UK we have been able to observe this up close and personal. Lecturers and support staff have been on strike for weeks over changes to pension schemes. They have already rejected one dirty deal done behind their backs by the UCU union and many are preparing to fight on. 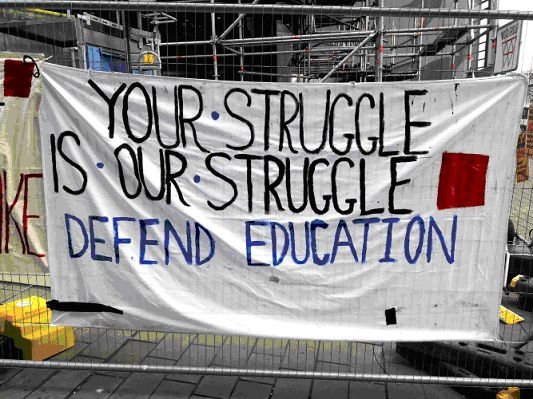 In this they have been given tremendous support by students and some ancillary workers who have transformed what could have been a mere sectional dispute into something wider. In the course of their struggle some education workers are gaining a new sense of class consciousness. After all, half of the lecturers are part-time, precarious workers on short-term or no contracts. The strike has also led to reflections amongst some of the lecturers about the purpose of their work and the nature of the society they are living in. Certainly this is only amongst a radical minority, but this represents some danger for a system which is churning out graduates when there are fewer and fewer graduate jobs. If under-employed graduates beyond the educational environment start to question what’s happening they could be part of a wider, more radical working class movement. Such a movement would have to break down the divisions of nationality, race, gender, ability, profession and union affiliation enforced on us. Inevitably this would involve challenging the boundaries of sectionalism and legalism imposed by the state, something that the unions are not ready to do. In the daily struggles over wages and conditions working people have only one weapon and that is their collective ability to withdraw cooperation with the employers. Both the ongoing UCU strike over pensions and that of West Virginia teachers were stirred by ordinary members but the union officials have been quick to do deals behind the workers’ backs. In West Virginia the teachers were simply told by automatic phone message that the strike was over, despite the fact the Governor had signed no agreement. In the UCU dispute the union is trying to sell the bosses’ trick of postponing the pension cuts for a year so they can prepare better for the next round. They have been halted by votes in meetings in branches and on picket lines. The union’s next step is likely to be an online ballot to undermine the solidarity of the strike. The problem here is not just that the union bureaucracy is unaccountable but it is part of the legal framework of the state. All unions exist to haggle over the terms of wage labour on behalf of the system. Any questioning of this, whether practical or otherwise, is ruled out. What the bosses and ‘authorities’ are truly afraid of is the kind of self-organised action of the working class that we have seen in West Virginia and the UK. Once we go beyond the trade unions’ rituals and the structures provided to us, that’s when we become dangerous, especially as more workers see the need to get involved. In the past workers often created their own structures which put the struggle directly into their own hands (be they neighbourhood assemblies, strike committees, workers’ councils, or even just independent workplace groups). Though often short-lived, genuine fighting bodies appear and disappear as struggles come and go. In terms of decision making, delegation, not representation, has been the classic method of organisation for the working class, from as far back as the Paris Commune. This cannot be accepted by the state and employers, and so they would much rather have unions control us instead. Yes a good opening text on the basis of current news relating to the Education sector though of course there is much more to consider in relation to significant changes in global working class composition over the decades since the 70's, including in relation to labour migration as much as the movement of capital across borders. Just shared this via the Anarchist Communist Group's twitter: communist anarchists.